Shortly after the end of the second world war, Grahame and Dinah Thwaite lose both their parents in a car accident. 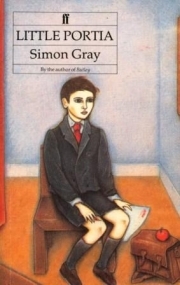 The novel follows Grahame’s life from then onwards, as a promising student at his prep school, a sporting hero at his public school, Windhoven, and a scholar at Cambridge. As his various successes accumulate, the key relationships in his life change, and he is increasingly plagued by feelings of failure and betrayal. Checking inside the book, I see that Faber and Faber published Little Portia in 1967. In those days it took over a year to move a book from typescript into the bookshops, and I have an idea – though I can’t be sure of this – that it took me about two-and-a-half years to write it. There were certainly long hiatuses at Cambridge when drink and poker became desperate alternatives to the typewriter, and I got married and moved to London, where I’d managed to land a lectureship at Queen Mary College, down the Mile End Road, between drafts. I can’t say between which drafts, as there were so many. Boxes full, in fact. I wish I had them now, to serve as an aide-memoire on a grand scale, but they’ve long gone. About a year after the novel was published someone at the University of Boston – I assumed the librarian – wrote alprazolam 2 mg online pharmacy asking if he could have any material I possessed connected with it. This seemed a perfect solution to an increasingly pressing problem. My study was small, I’d already started stockpiling drafts of something else I was working on, and yet I couldn’t quite bring myself just to chuck out the visible history of Little Portia with the other rubbish. I wrote back to the University of Boston, agreeing to allow them to help order my life on condition that I took no part in the arrangements. One day a couple of men arrived, surveyed without surprise (they weren’t literary critics after all – although one of them had a mildly rapacious smile) the mountains of labour out of which Little Portia had been born, packed them neatly into crates, and went off with them. So now, short of flying to Boston and foraging in the warehouses, I have nothing but the published novel to help me recall the writing of it. Which is why all I’m absolutely sure of is that I began it in Cambridge, and finished it in London, between 1961 and 1963, and that it was the move to London – as a suddenly fully employed and married man, with a child on the way – that finally unblocked me and made finishing it possible. And yet it remains for me not simply a novel mainly about and set in Cambridge, but a Cambridge novel – in its tone, its attitude towards its characters, and its pervasive atmosphere. Well then, if not a Cambridge novel, then a novel which had its seeds in my sense of Cambridge.